At DeAnda Elementary, we strive to build students who are not only excel in the classroom, but who also achieve phenomenal success outside the classroom. We are dedicated to molding and shaping the leaders of tomorrow through our three core values: excellence, collaboration, and leadership. DeAnda from Houston ISD on Vimeo. This is "What's Cool in HISD-Board Version" by Houston ISD on Vimeo, the home for high quality videos and the people who love them. Find out everything you need to be a Tiger! 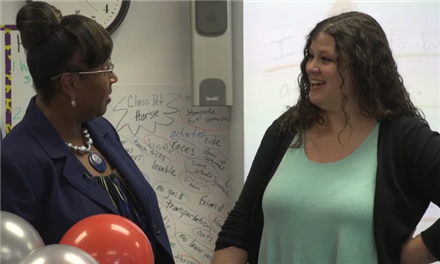 HISD recognized DeAnda Elementary School teacher Hillary Smith as the district's teacher of the month for October 2018.